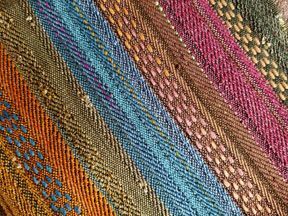 These scarves were woven in multiple colorways, clear bands of colors transition across the warp. This 8 shaft draft features a combination of plain weave, twill, and supplemental warps. Most of the yarns in these scarves are hand dyed with MX Fiber Reactive Dyes, in small quantities. Dye formulas are not included. Digital 4 page PDF download.